If you have been looking for an easier way to keep track of household expenses, this household expenses calculator template is a great, easy to use option. Whether you want to keep track of how much money you spend on items such as cleaning products and groceries or how much money is spent on every aspect of household expenses, the household expenses calculator can help. The Household expenses calculator can contain any categories you could possibly need- it’s all customizable. A Household budget calculator puts all spending into perspective. By organizing each type of expense into a convenient and easy to read format, the household expenses template allows you to see where you are spending most of your money and gives the opportunity to make educated changes. A Household expenses calculator can show you the categories that cost the most and show where money can be taken from to put into savings accounts, or be shifted to go towards paying off credit card debt, medical bills, or setting money aside in the case of unexpected emergencies. 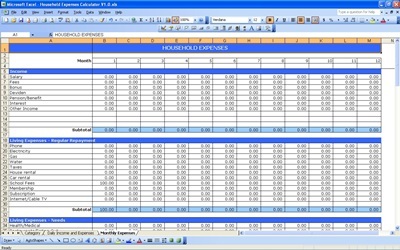 By downloading the household expenses template you can plug in the numbers and save it on your computer so all members of the household that contribute money to living expenses can see where their money goes. This household expenses template will eliminate the need for financial questions with the information in an easily accessible place. This household expenses template also allows you to make changes when expenses change. A household budget calculator can help answer many questions. If you’ve ever wondered where your paychecks go at the end of each month, or why you have no money left over to save; and you’re sick and tired of crunching numbers with receipts at the end of every billing cycle, the household expenses calculator will make organizing your home finances easier than you ever thought possible. Take a look and see how the household budget calculator template can make organizing your home finances a quick and easy task.